The holiday season is a busy, festive time of the year, filled with shopping, celebrations, family, visitors, and excited children. Why not make the San Bernardino County Museum part of your holiday tradition? The Museum is a perfect place to bring out-of-town guests for a visit. A Museum outing is affordable and fun for all ages, and it’s a great way to share the cultural and natural heritage of our region with your visitors. A trip to the Museum is also a great way to offer children on winter break a chance to recharge their batteries with some hands-on learning. Museum exhibits include “Welcome to Our World,” which illustrates the ways that animals and humans interact with the natural world. “Remembering Ramps” offers opportunities to look at everyday technology from the distant and not-so-distant past and to share your memories in the context of typewriters, cameras, and telephones. “Turn Left at the Rockies” invites you to explore California from the 1820s to 1850. See some dinosaurs in “Fossils Underfoot” and explore a sample of the third largest egg collection in the United States in our bird halls. And don’t forget to visit the polar bear in our Mammal Hall, and our live bunny, bugs, and reptiles in Exploration Station. The Museum Store is a convenient place to pick up last-minute stocking-stuffers—and if you don’t have time to visit the galleries, you can ask for a shopping pass at the front desk for a quick shopping trip in the Store. 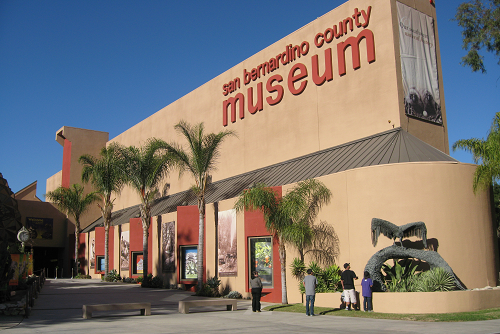 The San Bernardino County Museum’s exciting events and exhibits reflect the effort by the Board of Supervisors to achieve the Countywide Vision by celebrating arts, culture, and education in the county, creating quality of life for residents and visitors. The San Bernardino County Museum is at 2024 Orange Tree Lane, at the California Street exit from Interstate 10 in Redlands. The museum is open Tuesdays through Sundays from 9 am to 5pm. General admission is $10 (adult), $8 (military or senior), $7 (student), and $5 (child aged 5 to 12). Children under 5 and Museum Association members are admitted free. Parking is free. The museum will be closed on Christmas Eve, Christmas Day, New Year’s Eve, and New Year’s Day. For more information, visit www.sbcountymuseum.org. The museum is accessible to persons with disabilities. The non-profit organization Rear Area Support Foundation Inc. (RASF) and local veterans have set up the Global War on Terror Wall of Remembrance memorial at the San Bernardino Golf Club, across from the Inland Regional Center in San Bernardino where the Dec. 2 tragedy occurred. Panel 31 of the Global War on Terror Wall of Remembrance will be unveiled in San Bernardino this weekend in a ceremony honoring the 14 killed and those who were wounded in San Bernardino. Memorial founder Richard Nichols Jr. together with the American Legion Riders, area veterans and the San Bernardino Golf Club began displaying the memorial on Thursday, Dec. 10 at sunset. The memorial wall is open to the public 24 hours a day until 5 p.m. on Monday, Dec. 14. and security is present at the site. 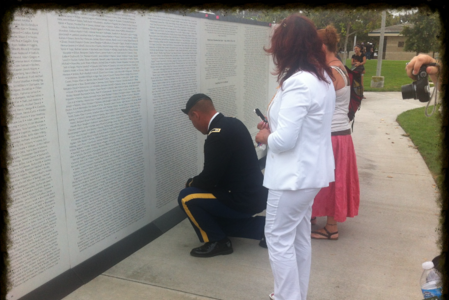 The Global War on Terror Wall of Remembrance is 100 feet long and 6 feet high with two sides. Side one is a full color education timeline about the Global War on Terror from 1983 to today. The second side has the names of all the military, heroes and victims from Beirut, the Gulf War, Sept. 11, 2001, Iraq, Afghanistan, Ft. Hood, Boston, Chattanooga, Paris and now San Bernardino, totaling almost 11,000. An unveiling ceremony and formal flag presentation will be held at 10 a.m. Saturday at the Golf Club. A sunrise service is being held at 6:30 a.m. Sunday at the Golf Club. The public is invited to bring chairs and arrive early for both events because parking is limited. The San Bernardino Golf Club is located at 1494 South Waterman Avenue in San Bernardino. The Board of Supervisors, County Public Health and Environmental Health managers, and doctors from Arrowhead Regional Medical Center will conduct a news conference at 7:30 a.m. today, Monday, December 7, to discuss the December 2 tragedy. Only the news media can attend the news conference, but everyone can watch it live on CountyDirect at http://www.sbcounty.gov/main/countydirect.asp. We are all deeply saddened by the events that occurred this past week. 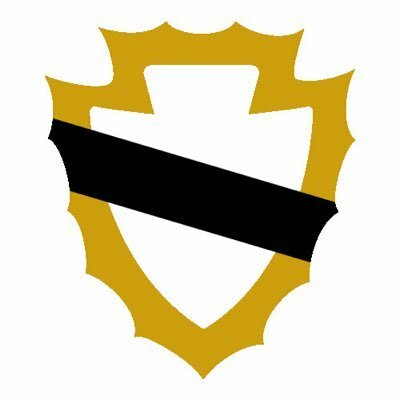 We mourn the loss of our fallen friends and pray for those injured to recover. Some of us witnessed horrific scenes unfold in front of our eyes. This has shaken all of us. Yet, we are grateful for the many lives that were spared. We need to come together and strengthen one another other as we say goodbye to our beloved coworkers and seek to heal wounded hearts.This past week Corwin and I were able to visit many of our injured in various hospitals. We were amazed out how positive and upbeat our colleagues were despite their injuries. We were happy to see many in stable condition and others being released to return home. Because this has touched us all deeply, please do not hesitate to access the counseling hotline at 909-421-9495 to help in the coping and healing process. All county offices with the exception of Environmental Health Services will resume full operation on Monday, December 7th. Environmental Health will return on December 14th. In the meantime e-time will be taken care of for EHS employees by payroll and you will be paid as usual. Security will be increased at public health buildings throughout San Bernardino to provide added peace of mind. In addition all Environmental Health staff from the Rancho and San Bernardino offices will report to 172 3rd St. on the 14th of December. Additional details regarding this relocation will be provided during the coming week. Some have asked what they can do to help. Several charities have been established so there is an opportunity to donate to the charity of your choice. 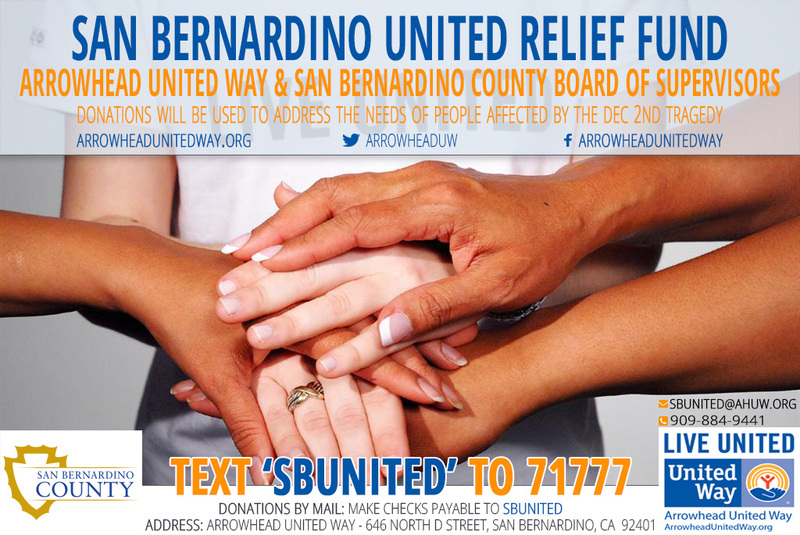 The County Board of Supervisors and the Arrowhead United Way also established the “San Bernardino United Relief fund” for all those affected by the December 2nd incident. The FBI is planning to release vehicles and personal items within the coming week. You will be contacted by the FBI with details on when and where this will occur. We are strong. We will get through this together. Thank you for your courage during these difficult times. Should you have any concerns or needs, please do not hesitate to let us know. The County Board of Supervisors and the Arrowhead United Way jointly established the San Bernardino United Relief Fund for the victims of Wednesday’s tragedy. Donations will be used to address the needs of people affected by the Dec. 2 incident at the Inland Regional Center building in San Bernardino. Donors may text ‘SBUNITED’ to 71777 and will be provided a link on their mobile phones to donate. Checks made out to SBUNITED are also accepted by mail at Arrowhead United Way, 646 North D Street, San Bernardino, CA 92401. For more information, contact the Arrowhead United Way at (909) 884-9441 or visit www.arrowheadunitedway.org. A message from the Board of Supervisors to County employees. Words cannot describe the sadness and horror the Board of Supervisors feels in the wake of this unimaginable tragedy. The county’s role and focus at this point is providing support and safety to our employees, their loved ones, and our community. For that reason, the Board of Supervisors tonight took action to suspend all but only the most essential county services tomorrow, December 3, and Friday, December 4. The Board will do everything within its power to assist, provide services, and comfort everyone affected by this traumatic event. Law enforcement has the county’s full support in its effort to address this incident, find out what happened and why, and bring those responsible to justice. I would like to thank Governor Brown for personally contacting me to offer his condolences and support during this difficult times. The county is thankful for the support our agencies have received from the state, the federal government, and our neighboring cities and counties. Words can’t describe how saddened and horrified we are about this tragedy. Our hearts go out to the victims. The Board of Supervisors is monitoring the situation and is in communication with law enforcement. Media should contact the San Bernardino Police Department for more information about the shooting at 909-383-5311. The County has taken precautions to protect the public and County employees. County employees who are working within the City of San Bernardino were sent home for the day. Security has been provided at County facilities within the city as a precaution.